Nvidia’s gearing up for yet another big November giveaway to drive GeForce Experience usage. Just like last year, all you have to do is download and install the superb GeForce Experience software and use it to install the latest Game Ready drivers from Nvidia. In 2015, the giveaway prizes included three AAA game titles, Shield Android TV units, and a few graphics cards. This year’s giveaway is a single game: Gears of War 4. Nvidia says Gears 4 was a gaming highlight in 2016 because it, “reinvigorated a flagship game franchise and is regarded as a landmark title for DirectX 12 done right.” Plus, it’s one of the debut Xbox Play Anywhere titles, and the first Gears game to launch on PCs the same day as consoles. Gears of War 4 carries on the wonderfully visceral pop-and-stop gameplay the series is famous for, offering a variety of single player and multiplayer modes complete with cross-play between PCs and consoles in co-op modes. 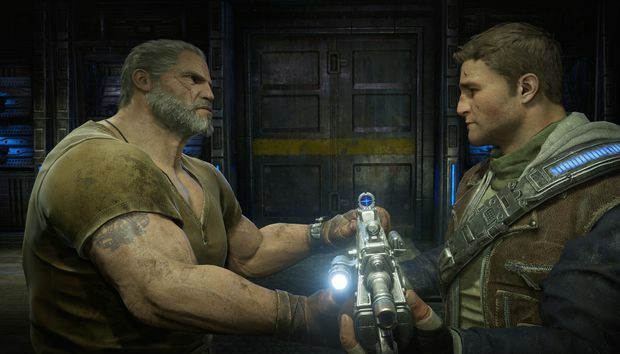 The campaign’s a bit bland compared to previous Gears games, with a ho-hum protagonist and uneven pacing, but Gears 4’s PC performance is anything but. In fact, we declared the port “downright marvelous” after subjecting it to a slew of graphics card tests. Regardless of whether you agree with our take or not, it’s hard to quibble with potentially receiving a $60 game for free—especially from such a storied franchise. This latest promotion follows on the heels of recent Nvidia giveaways that gave GFE 3.0 users free graphics cards, VR headsets, gaming laptops, and several games (including Shadow Warrior 2 and Obduction). The story behind the story: Nvidia’s recent giveaways are all about getting you to download GFE, but the implications of this year’s giveaway aren’t quite the same as in 2015. Last November, Nvidia’s giveaway was held in the shadow of plans to lock Game Ready drivers behind GFE. If you didn’t run GFE, you’d either have to sign up or settle for quarterly driver releases—or so Nvidia said at the time. The threat of the GFE driver lockdown never came to pass, though Nvidia hasn’t officially said why. With the latest graphics cards war in full swing the company may have feared the potential backlash. Nevertheless, Nvidia would like nothing more than for its users to run GFE. GeForce Experience 3.0, which rolled out earlier this year, requires you to either sign up via Facebook or Google or register an Nvidia user account in order to use it, giving Nvidia direct access to you—and more personally identifiable information about you. On the plus side, GFE offers one-click game optimization, the ability to record your gameplay, a hub to optimize streaming PC games to your Nvidia Shield TV, cooperative multiplayer with far-away friends, easy Game Ready graphics driver installations and notifications, and more. Speaking of Game Ready drivers, if you do download GFE today, don’t be so quick to snagthe latest driver update. TechRadar reports that Nvidia driver 375.86 is causing video memory speed performance hits on some factory overclocked GTX 10-series graphics cards, locking speeds to 810MHz. Nvidia customer care says it’s aware of the issue and is working on a hotfix—which you’ll want to wait for if you have an overclocked GTX 1060, GTX 1070, or GTX 1080. This is the second time in as many months that Nvidia has had driver issues. In October, driver 375.57 wreaked havoc on Windows 10 systems, and Nvidia released driver 375.63 to fix the issues soon thereafter.